>ATI ELM327/ELM-USB v1.0 (c) SECONS Ltd.
Notice: Identification starts with "ELM32" in order to maintain compatibility with legacy applications. Retrieve ELM-USB unique interface serial number (ELM-USB specific, not part of ELM32x command set). >ATZ ELM327/ELM-USB v1.0 (c) SECONS Ltd.
>ATWS ELM327/ELM-USB v1.0 (c) SECONS Ltd.
Usage: ATLn, where n is 0 or 1. Usage: ATEn, where n is 0 or 1. Usage: ATHn, where n is 0 or 1. Usage: ATSPn, where n is 0 to 9. Usage: ATTPn, where n is 0 to 9. Tries connection with selected protocol (protocol numbers are same as in ATSP). 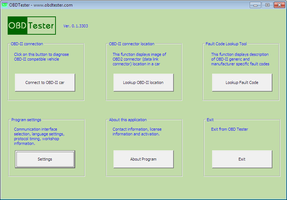 Performs an OBD-II protocol buffer dump. Not to be used by applications. Communication is automatically established when this command is issued. Notice: try setting ATSP0 (auto protocol detection) if you get this error.